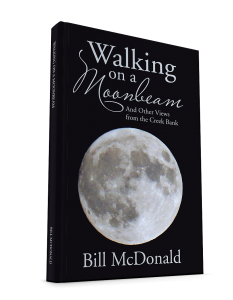 Walking on a Moonbeam is a collection of poems written during Bill’s career as an engineer/scientist working in the US space and national defense programs. The poems were written based on personal life experiences and are organized into nine topics: youth, adventure, love, seasons, change, hope, places and things, farewells, and prayer. Consequently, it also tells much of his own personal story, beginning with his youth, continuing with his adventures in the United States moon program, and covering many of the events, activities, and circumstances of his life. The reader will gain an understanding of a young boy’s life in rural Mississippi during the 1940s and 1950s, feel the excitement of putting the first man on the moon and returning him safely to earth in 1969, experience the emotion of extended separation from your loved one while in pursuit of critical national defense objectives, and much, much more. Copyright © 2017. Bill McDonald. All rights reserved.